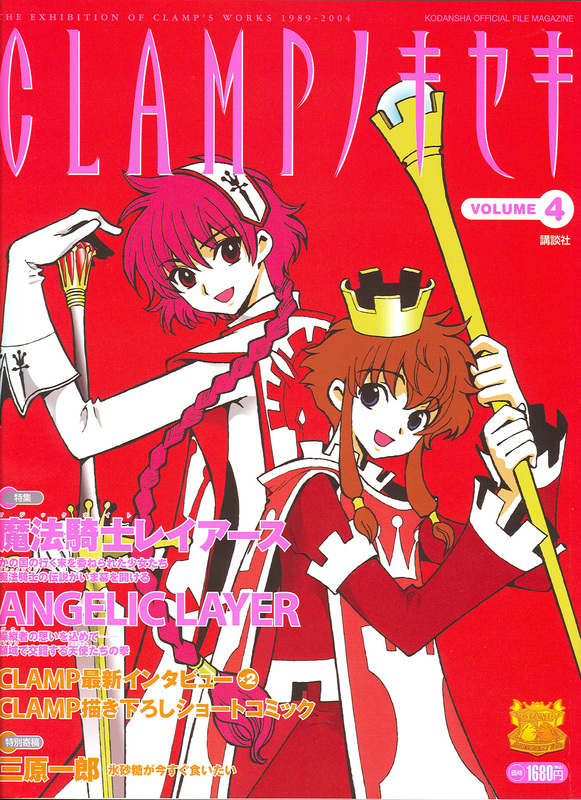 Please tell us about how Magic Knights Rayearth came to be serialized. Ohkawa: When we were invited to draw the illustrations for the Souryuuden novels, we went to the celebratory dinner event they held, and there was Yamanouchi-san, the editor to Nakayoshi at the time. (Currently he works in the editorial staff for Young Magazine and is in charge of CLAMP there.) He asked us if we were interested in working for Nakayoshi, but I thought he was just being polite. Mokona: But then the day afterwards, or the day after that, he called us. How did you come up with the idea to combine magic and giant robots? Ohkawa: Seeing how the editorial staff didn’t give us any guidelines as to what the content should be, and since we had been invited to work for them, we decided to create something that no one had ever tried before in Nakayoshi. There were few stories with girls fighting but none with giant robots. *laughs* Thinking that a story just about robots would be hard for the Nakayoshi readers to get into, we added the RPG-Fantasy-ish element. I think it’s rare for female mangaka [manga creators] to draw giant robot stories. Mokona: But there’s a huge difference between watching and drawing. *laughs* It was hard to make it into a manga. Nekoi: One difference in drawing them for manga versus anime, in manga it’s harder to demonstrate their size. Mokona: If you draw the robots too big, you can’t fit in other objects into the same panel to serve as contrast, which stops you from showing its size. That, and if the characters are inside the robot, you can’t show their faces. Ohkawa: The reason we didn’t design a cockpit was so that we could show our heroines’ expressions. Nekoi: Drawing Rayearth required a lot of time and effort. There were the clothes, the hair, the robots, and the style of screen tone we chose was so intense we nearly died. *laughs* It was hard– once we finished penning, we’d have to go straight to sticking on the screen tone. Igarashi: Even Mokona’s body needed tone. Why did you name the series what you did? Ohkawa: “Rayearth” is a word that Okazaki-san (Takeshi, illustrator) thought up. Mokona: We asked him for a name that sounded like a car, and that’s what he gave us. Ohkawa: As for “Mahou Kishi” (Magic Knight)… that might’ve been me. *laughs* I had already come up with the story, and I had decided that the words “Magic Knight” would be part of a sort of mystery. All the characters are named after cars, right? Ohkawa: I can’t ever remember character names from fantasy stories. *laughs* There was that, and I thought that young children wouldn’t be able to remember them either without a theme. Car names are well designed/researched, so there’s a lot of cool, easy to remember names. I thought this would help the readers connect with the characters. The finale to part 1 is quite shocking; did that decision evolve naturally? Ohkawa: Part 1 went by quickly. That scene was what I wanted to create the most. If the serialization had been in a magazine for older boys, or for older girls, we might have been forced to end the series there. Mokona: There were arguments for either way, especially since we had frightened the younger readers. There’s a lot of bonus-materials that come with Nakayoshi, do you have any particular memories about them? Mokona: The trump cards set. Mokona: One of our members had a girl’s magazine with a card set where they designed not just the back, but made drawings for each and every one of the cards. We were inspired by that. *laughs* Though our editor said it was fine if we drew just the backs. How did you feel about the Rayearth anime, your first series on TV? Lastly, how do you view Rayearth? Ohkawa: Since we created it with the intention to not change our style at the time, many parts of it are influenced by our previous series. The drawing style isn’t all that different, the story content isn’t all that light, and the jokes… *laughs* You could say that it is the epitome of our mid-career style. Interview originally published in CLAMP No Kiseki vol. 4 (Kodansha), released on December 22, 2004.